With possible additional meteorites still in the field, the Tamdakht fall promised the invaluable opportunity to document recently fallen masses in situ. Therefore we encouraged our correspondent to inform locals not to move any potential finds before it would be able to record the find situation. The meteorite formed a 15 cm deep impact pit before it ricocheted and fell 2.40 meters towards the east from the impact pit it just had created. The 3.5 kg mass came to rest on the surface that was the trailing side during the impact. One small fragment that chipped off the impacting flank was thrown 1m towards the south. Numerous small fragments weighing 1g to the size of powder were found in the impression left by the first impact. With possible additional meteorites still in the field, the Tamdakht fall promised the rare opportunity to document recently fallen masses in situ. Therefore we encouraged our correspondent to inform locals not to move any potential finds before it would be able to record the find situation. The meteorite formed a 15 cm deep impact pit before it ricocheted and fell 2.40 meters towards the east from the impact pit it just had created. The 3.5 kg mass came to rest on the surface that was the trailing side during the impact. One small fragment that chipped off the impacting flank was thrown 1m towards the south. Numerous small fragments weighing 1g to the size of powder were found in the impression left by the first impact. In the last week of January a local nomad from the team of M. Aid reported the find of a new mass. The spot was located about 3 km from a 2 kg individual previuosly found on January 17 near the village of Ait n’Farss (Tiguert Ait n’Farss 01). As he was asked to, the finder left the find situation undisturbed to allow extensive photographing of the spot. This was done by M. Aid on February 3, four days after the find and 45 days after the meteorite had impacted. The Tiguert n’Ait Farss 02 mass was found on 31° 08′ 11”N and 07° 08′ 54”W about ten kilometers north of Tamdakht. It impacted at an altitude of 1595 meters on a gently sloping gravel plain overlooking the village of Ait Farss in the Tiguert Canyon. At the spot of the fall the bedrock has a thin 5-30 cm cover of topsoil with loose gravel on top. The meteorite impacted to a depth of 15 cm before it ricocheted and fell 2.40 meters towards the east from the impact pit it just had created. The 3.5 kg mass came to rest on the surface that was the trailing side during the impact. One small fragment that chipped off the impacting flank was thrown 1m towards the south. Numerous small fragments weighing 1g to the size of powder were found in the impression left by the first impact. The impact pit itself has a depth of 15 cm and is slightly elongated in an east westerly orientation. The pit was shaped either by the shape of the meteorite or, more likely, because of an inclined angle of the fall. This would also explain the sharp edges of the westward side of the hole and the sloped edge at the eastward side. The closer surrounding of the impact is covered with a thin blanket of dust and soil ejected from the hole. The ejecta blanket is also oriented towards the east. At the bottom of the hole the meteorite encountered a solid rock which is probably responsible for the rebouncing of the mass. On inspection the slightly concave meteorite with the shape of a hammer displays a velvet textured dull black fusion crust that shows no oxidation. Several chips and a missing fragment in one flank show a fresh busy blue grey matrix with first visible halos around Ni-Fe aggregates. Other small chips are much darker and it seems they sheared off of the meteorite during the last phase of the hot flight. These show an irregular sooty coating. The find location of the Tiguert n’Ait Farss 02 mass is ~3 km northwest from the next closest mass found previously. Its find extended the strewn field known to that date (February 12) to a lenght of ~16 kilometers. There is still not sufficient data to draw a precise strewn field axis but it is safe to say that the distribution ellipse has a general west east orientation. This is consistent with the eye witness reports on the fireball’s trajectory. A minor deflection of the orientation of the distribution ellipse might be due to wind drift. The area where the Tamdakht meteorites fell is sparsely populated but there are chances that more finds will be discovered in the future. 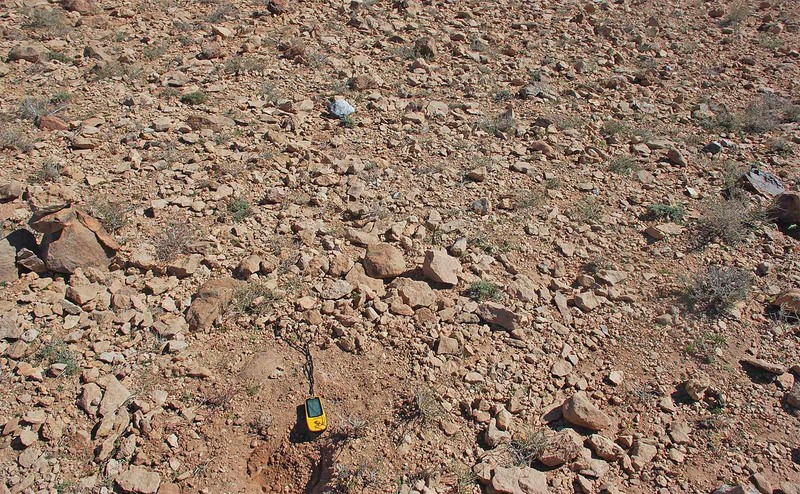 According to the finders, the single masses are particularly hard to spot in the rocky terrain. Although climbing the mountains for many days in search for meteorites it took the finder of n’Ait Farss 02 two weeks to find his first Meteorite. The image below shows the view from the find location of the Tiguert n’Ait Farss 02 mass towards the east. The village of Ait Farss can be seen at the bottom of the Tiguert Canyon. On the far left side of the photo the foot of the Djebel Tamakoucht is visible, which is about 8 kilometers away. The next closest meteorite find is a 2.007 kg individual that was found ~3km to the southeast (Tiguert n’Ait Farss 01). With a strewn field length of at least ~16 km and a width of at least ~4.5 km at present the shower producing Tamdakht meteorite can be considered a fall of major importance. 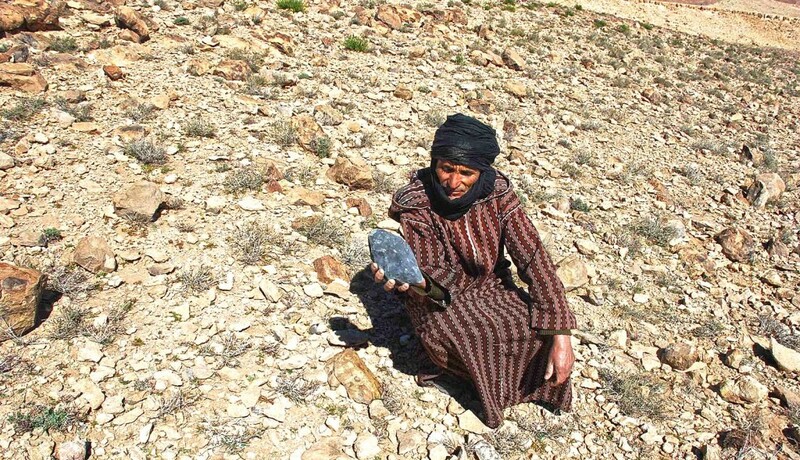 With a current TKW of ~77 kg Tamdakht is already the biggest meteorite fall in the history of Morocco. Until 2008 only four witnessed falls were known: Douar Mghila (1932), Oued el Hadjar (1986), Bensour (2002) and Benguerir (2004). All were LL-6 chondrites. With a TKW of 45 Kg Bensour until present was the largest fall of this list, but although known as a Moroccan meteorite the fall in fact occured in the Djebel Ben Sour ~100 km south of the border and well within Algerian territory (correspondence with P. Thomas).